A Parks Canada manager says what's believed to be the most visited glacier in North America is in danger of disappearing within a generation. What's believed to be the most-visited glacier in North America is losing more than five metres of ice every year and is in danger of completely disappearing within a generation, says a Parks Canada manager. "It's astonishing," John Wilmshurst, Jasper National Park's resource conservation manager, said in an interview with The Canadian Press. "Every year we drive stakes five metres deep into the glacier in the fall. We have to return and re-drill them in mid-summer because a lot of those stakes on the Athabasca Glacier, the one that a lot of people go visit, will be lying flat on the ice at that time. "We're losing at least five metres a year on the surface of that glacier." The passage of time is clearly visible at the ice sheet's base. Markers dating back as early as 1890 show the toe of the Athabasca Glacier has retreated 1.5 kilometres, leaving a moonscape of gravel and rock behind. "We're doing our measurement close to the toe of the glacier and the amount of growth each year is dwarfed by the amount it recedes," said Wilmshurst. 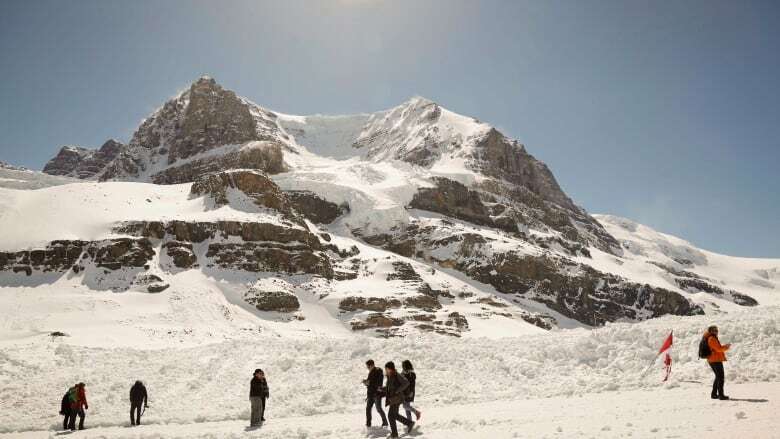 Bob Sandford, chairman of the Canadian Partnership Initiative of the UN Water for Life Decade, said it's "mind boggling" because not only is the glacier receding — it's also becoming more shallow. "I first wrote a tourist book on the Columbia Icefields in 1994 and it was generally held that it was somewhere around 325 square kilometres. That icefield now is calculated to be about 220 square kilometres," he said. "Even though this year we will have had a fairly substantial snow year, what we're finding is that, even with substantial snow years, the summers are warm enough and the fall is prolonged enough that all of that snow goes and we're still losing five metres," Sandford said. "That gives you an indication of how rapidly things are changing." A recent American state-of-the-union report has singled out the rapid melt of glaciers in British Columbia and Alaska as a major climate change issue saying they are "shrinking substantially." Wilmshurst said it's estimated that the Athabasca Glacier is about 300 metres deep, but it is slowly disappearing. "It is hard to know in the long term what climate cycles mean to people. It does mean we should be preparing for drier conditions in the future. I think long term it's not good news at all," he said. "Absolutely the glacier will be gone. Not within my lifetime, probably, but maybe within my children's lifetime."